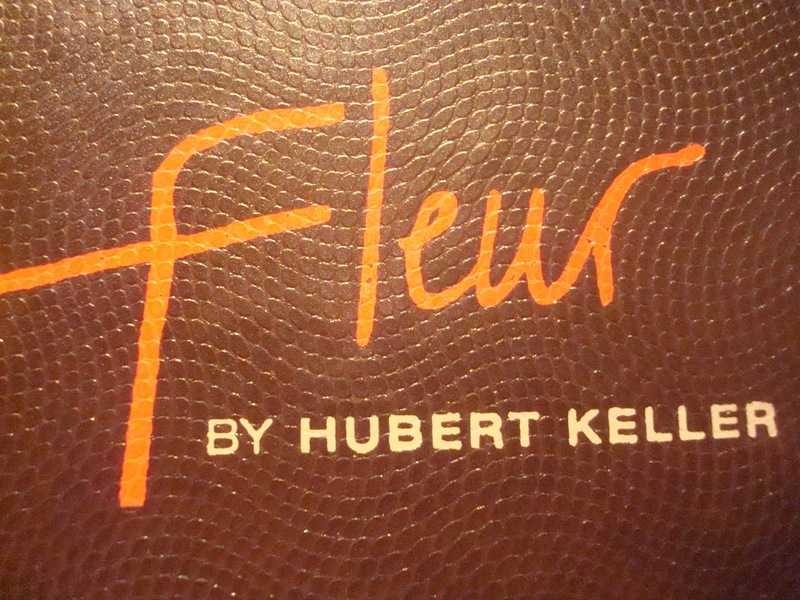 Chef Hubert Keller does it again in Las Vegas with his name sake Fleur by Hubert Keller located in the Mandalay Bay in the venue previously occupied by his renowned Fleur de Lys. 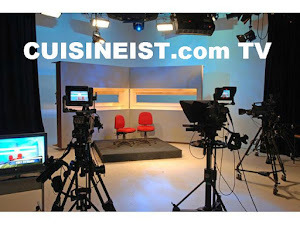 Chef Hubert Keller is known throughout the world not only as a classically trained French Chef but an author and TV host has well. We really can’t talk about his newest venture without taking a look on how this incredible Chef got his start. Keller was born in Alsace, France, and graduated from the École Hoteliere in Strasbourg. Beginning as a pastry chef, he worked in various restaurants including Auberge de L'Ill, the cruise liner Mermoz, Domaine de Chateauneuf, and Moulin de Mougins in France, and La Cuisine du Soleil in São Paulo, Brazil. He trained under Paul Haeberlin, Paul Bocuse, and Roger Verge before coming to San Francisco in 1982. By 1986 he was already well known as one of the Top French Chefs in the world and began setting his roots down in the United States. 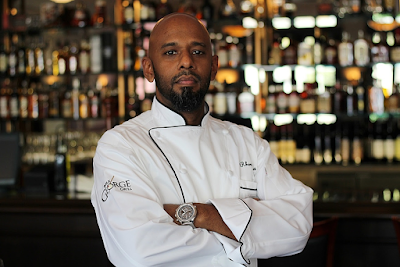 He became co-owner and executive chef of the original Fleur de Lys in San Francisco. 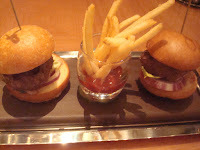 He later opened a gourmet Burger Bar in Las Vegas, Nevada, which features a $60 "Rossini Burger" made of American Kobe beef, sautéed foie gras, and shaved truffles. He then opened a second Fleur de Lys, at Mandalay Bay and also branched out to St, Louis where he opened a French influenced steakhouse in Downtown, SLEEK, which is regarded as the best steak house in St. Louis. Chef Keller also was the consulting chef at the Club XIX, at the Lodge in Pebble Beach in Pebble Beach, California. And as if being a Chef / Restaurateur did not keep him busy enough he also authored The Cuisine of Hubert Keller and is the co-author of Dr. Dean Ornish's Eat More, Weigh Less. He was the first guest chef with Jean-Marc Fullsack to cook a dinner for a president (Clinton) in White House history and to train the White House chef in healthy cooking with the guidance of Jean-Marc Fullsack. 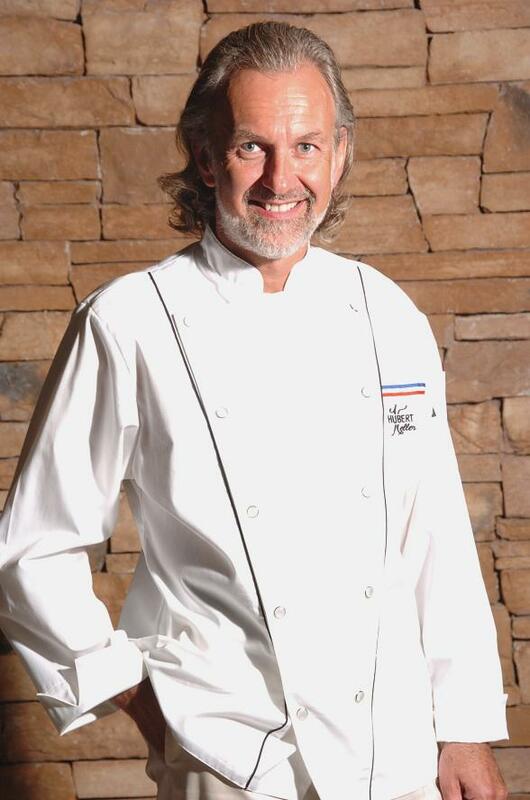 Chef Keller has been recognized by most of the prestigious culinary organization and publications in the United States. 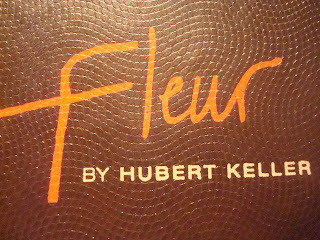 In 1988 Hubert Keller was ranked as one of the "10 best new chefs in America" by Food & Wine magazine. In 1997 he won the James Beard Foundation/Perrier-Jouët award for America's Best Chef in California. He also received the James Beard Foundation's Who's Who of Food and Beverage in America lifetime achievement designation in 2003. In 2006, Keller was named the best culinary ponytail award winner, according to Men's Hair magazine. His Restaurant Fleur de Lys has been ranked as one of the top 40 restaurants in the United States in 2004, 2005, and 2006 by Gayot restaurant guide, and was awarded one Michelin star in 2006. Fleur de Lys has also been ranked as one of the top 25 restaurants in the United States by Food & Wine magazine. 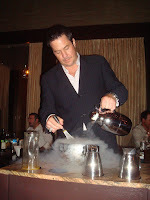 We had dined at Fleur de Lys in Las Vegas several times over the years and were always impressed with the classic décor , unique chefs table, immaculate service and of course great French cuisine as only Chef Keller could create. 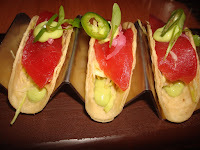 Fleur’s concept of tapas had us wondering how this would work as we walked into Chef Keller’s newest creation. 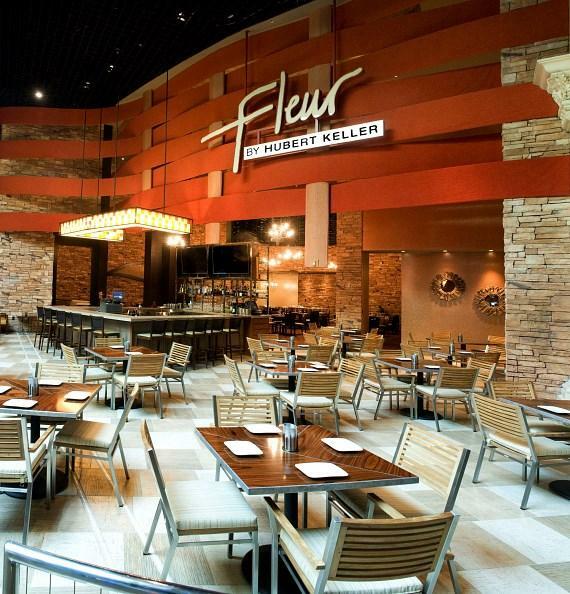 Walking into Fleur you first notice its “ open air “ casual tables and a lively bar with plasma TVs. As we walked past the tables near the bar guided by our hostess to our table in the main dining room we gazed upward to the Chefs table overlooking the dining room surrounded by hundreds of bottles of wine which brought back fond memories of Fleur de Lys . The décor in the main dining room features earth tones of brown and beige with lighting in the shape of trees which gives guest a warm inviting feeling. “Fleur is about globally inspired Tapas” stated GM Owen Deignan as he met us at our table and welcomed us to Fleur. The word “global” inspired us so we put ourselves in the very capable hands of Chef Keller and his Chef de Cuisine Steven Wolf. Our first stop as always, was perusing through the very extensive wine list. The wine list features most of the “trophy” wines that you would expect from a venue such as Fleur but also offered a nice variety of wines from $ 60.00 and up. We chose a nice Cote du Rhone that we expected should pair well with whatever Chef Keller and Chef Wolf sent out. We started our journey with a lovely Hummus and Baba Ganoush Flat bread that tantalized our palates with layers of exotic flavors that kept us on the edge of our seats to see what was next. 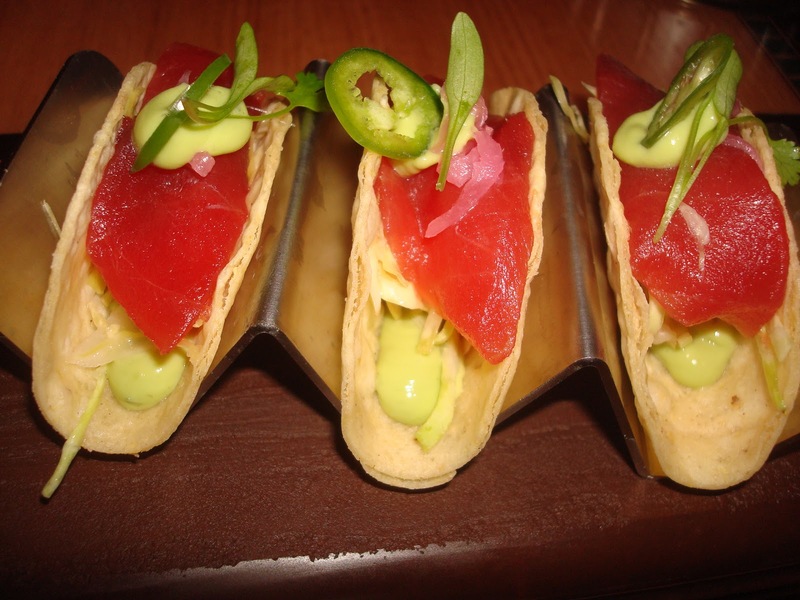 When our very attentive server brought out the AHI Tuna Tacos , the dish was so pleasing to the eye we just wanted to stare at before we went any further. The expression “ you eat with your eyes” could not be more true of this dish. The pepper provided just the right heat and a nice avocado foam to cool things down made this a very balanced dish and one of our favorites of the night. This dish was put together very well. The salted Cod Fritters with Serrano and Garlic Romesco lived up to its name. We waited with anticipation to see where the Chefs would take us for our next stop . 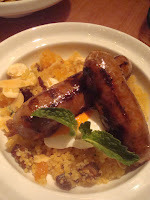 A North African dish that is also popular in Northern Europe, The Merguez sausage with saffron gave our palates at treat of some wonderful exotic flavors that Chef Keller creates better than none other. What would a Tapas restaurant be with out Sliders ? Fleur does it as good as anyone with juicy Angus Sliders with creamy blue cheese , onion , crispy bacon and a nice contrast of pear. We will come back just to enjoy this dish once again. After spending most of the night at Fleur dining our way around the world with Chef Keller could we have “room”for anything else ? Of course ! and it was now time for the finale and what a finale it was. 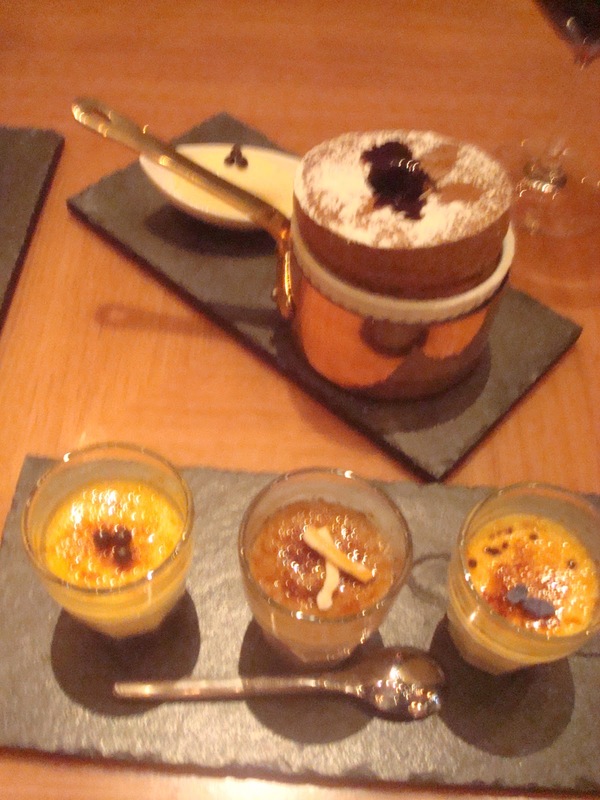 A Crème Brulee trio featuring Earl Grey , Orange and Cookie was a exquisite introduction into one of the best Chocolate Souffle’s we have had. 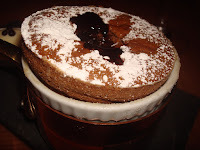 The lightness of the Earl Grey was the perfect lead into the Souffle at the end. These dishes were decadant, delicious and should not be missed . GM Owen Deignan had been speaking to us all night about some very special cocktails with quite a presentation, so we had to indulge and we were very glad we did. 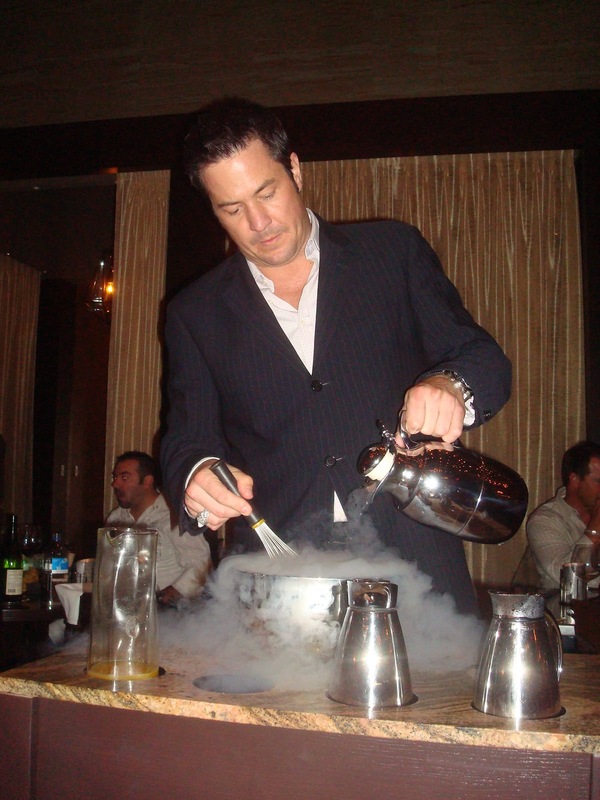 A combination of Passion Fruit , Sea Salt and Cheyenne pepper made table side in cloud of liquid nitrogen . The end result is a lovely cocktail with a consistency you can eat with a spoon. Fleur has a couple great specials to indulge in as well. For those who enjoy Classic French wines and a one of a kind burger Chef Keller offers his FleurBurger 5000 wagyu beef, foiruffle gras, with A bottle of 1995 Château Petrus for $ 5000.00 . If the Fleur Burger is a little out of your range. Chef Kellers “in the shower” mac & cheese lobster, brunoise vegetable is a dish that he created for Master Chefs that really shows off his creativity in layering flavors. Chef Keller has captured what people are looking for in these days and times. His culinary artistry is now available and approachable for families and many others than may not have been in a position to dine at Fleur d Lys in the past. More people should be exposed and gain an appreciation for creative, fresh dishes from a Celebrity Chef such as Chef Keller . 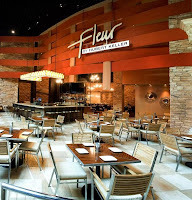 They can gain that knowledge and appreciation for innovative cuisine and exceptional service at Fleur. The Santa Lucia mountains rise from Monterey's County's fertile Salinas Valley on the west, separating it from the Pacific Ocean. The vines of this steep hillside district enjoy cooling ocean breeze and fog from Monterey Bay. This results the finest early varietally-labeled Pinots from the district. Slow, gentle ripening that is California's longest “hang time” creating exceptional intensity, complexity, and balance in the grapes. The McIntyre estate vineyard is located in the central section of the Santa Lucia Highlands. The vineyard was originally planted by the McFarland family in 1973 and boasts some of the Highlands’ oldest Pinot Noir and Chardonnay vines. In 1979 a Pinot Noir from the vineyard, under the “Stony Hill” label, is still regarded as one of best produced from the area. In March 1987, Steve McIntyre purchased the eighty acre property and put his years of experience to the test. Through three decades, the McIntyre family has been setting the standard for winegrowing on the Central Coast and in Monterey County. Steve McIntyre graduated with a Masters degree in Enology from CSU Fresno. He has planted and managed vineyards for numerous wineries including Galante, Smith & Hook, Mondavi, Joseph Phelps and Bonny Doon and has grown grapes for such prestigious wineries as Williams Selyem, Morgan, Artesa, Jordan, Bernardus, MacRostie, and Marilyn Remark to name a few. Long before the “green” movement , Steve McIntyre helped “write the book” on sustainable winegrowing in the Santa Lucia Highlands appellation. This founding family has been farming in a responsible, sustainable manner long before such practices became the “in” thing to do.They grow grapes organically and biodynamically for several wineries and apply many of these techniques to their winery as well. They farm in a “sustainable system.” carefully taking into account everything that happens in and around the vineyard . Sustainability is a self correcting discipline that not only impacts the environment but society (their employees) and the bottom line as well. Prior to the 2009 harvest, McIntyre’s submit the copious documentation required on every aspect of its farming practices and face the independent auditor responsible for maintaining the strict new “sustainability” standards. Because of McIntyre’s two decades history of careful, conscientious stewardship of their Santa Lucia Highlands’ vineyard, they passed with flying colors. The McIntyre estate holds "certified sustainable" status from both the CCVT's SIP program and the statewide CSWA. Today the McIntyre Vineyard keeps their focus on producing high quality Pinot Noir, Chardonnay, Merlot and a very special bottling of Sparking wine as well. We had the opportunity to have a focus tasting with Cheryl Warner , McIntyre Sales Manager to get to know these wines intimately. Monterey County is known for its light and flavorful Chardonnays. 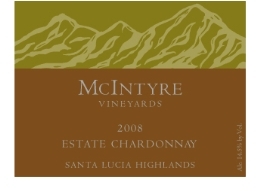 The McIntyre 2008 Santa Lucia Highlands Estate Chardonnay was a nice break from very “oaky” Chardonnays that don’t allow the true essences of the varietal to be appreciated. The 2007 Vintage earned a 92 point score from Wine Enthusiast which increased our expectation of the 2008 Vintage. On the nose , this lovely Chardonnay gave us aromas of grapefruit and orange giving way to lively citrus notes and balanced acid on the palate with hints of toast and butter on the end with a long finish . With only a 375 case production, this lovely Chardonnay was light, refreshing and fruit forward showing the passion that went into making this true to the varietal wine. We had the opportunity to attend a Pinot Noir focus tasting last year and tasted Steve McIntyre’s Pinot Noirs along with many of the other living legends that produce some of the best Pinot Noirs ion the world. We looked forward to exploring them in much closer detail. Arroyo Seco is located just east of the Southern boundary of the Santa Lucia Highlands and is very well known for its Chardonnays and Pinot Noirs. In the glass The 2006 Mission Ranch is quite deep ruby in color and full bodied On the nose, big but nor overwhelming aromas of Cherry and blackberry jump out . Other similarly dark fruit flavors, spice and smoke join with cherry on the palate with a silky smooth finish. This wine is a great example of what can be done with Pinot Noir in the hands of a veteran. This Mission Ranch Pinot Noir is a big boisterous Pinot Noir but can still be called light and pretty . Like most Pinot Noirs that pick up a signature for its terrior this one is no exception , with a spice note and dark fruit flavors that is a signature of the Santa Lucia highlands and Arroyo Seco. A 400 case production makes this Pinot Noir a real gem and should be enjoyed after decanting to allow all of its unique flavors and Aromas to open. Once again , our palates were salivating with anticipation when we opened this lovely 92 Point Wine from Wine Enthusiast. Steve used two clones of Pinot Noir sustainably grown from their estate vineyard located in the heart of the coveted Santa Lucia Highlands appellation . On the nose characteristic light cherry and raspberry notes flow into a palate of cola and red jammy fruit with spice and a long elegant finish. This wonderful Pinot Noir was only the second Estate Pinot Noir to date and is very special. So special in fact , we took a bottle of the 2007 Estate Pinot Noir into the world renown Palme D’ Or restaurant in the historical Biltmore Resort and Spa in Coral Gables Florida and shared it with the Wine Director / GM and Chef. Steve McIntyre is a true legend and his wines reflect his passion for winemaking and growing. We look forward to visiting again soon as he is in the midst of planning a “green” winery and visitors' center for their estate vineyard. The new facility will reflect their decades-long commitment to sustainable winegrowing. In addition they plan to make conscientious use of the natural attributes of their estate, employing solar collectors and even wind power, taking advantage of those famously strong Highlands’ breezes off Monterey Bay.